The folks that have developed and maintained the MormonThink.com website have never asked for money to develop and maintain the site. This is a labor of love for us. However, some readers have asked if they could help cover the cost of maintaining and improving the website. We will gladly accept any donations which we will use to pay for the yearly hosting of the website, domain name registrations, software upgrades, platform upgrades, etc. Monies received are used to keep the MormonThink site running and to continue to improve its content and appearance and keep it as up-to-date as possible. If any of lour readers wish to contribute to the site with their talents instead of financially, email us from the contact page. Another way to help is simply to link to MormonThink with your blog, website or FaceBook account. This will help drive traffic to our site. For more information on what you can do to help the cause taken up by many LDS-themed sites designed to share related information on Mormonism, please visit this site: How To Help. When we have sufficient funds, we also do advertising campaigns. Due to the prompting of many readers, we have done two advertising campaigns thanks to the generous donations of our readers. 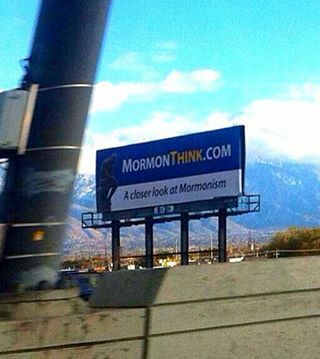 We're pleased to announce, that after much effort, the MormonThink billboard went up on November 4, 2013 off of I-15 just south of Salt Lake City between 33 South and 45 South. It's on the left side of the road (because right-reads were not available in the area) and will be there for at least 30 days. UPDATE: Due to the success of the sign, traffic to the site has gone up significantly, so we extended it for another 3 weeks. The billboard was up from Nov 4 2013 until Dec 22 2013. We finished up a FaceBook advertising campaign to increase our presence on the web. The LDS Church continues to run a much larger, but somewhat similar campaign. Our campaign was pretty successful with several referrals, emails and expressed interest in the site by those wishing to learn more about accurate LDS history that they don't teach in Sunday School. We raised over $2,000 for this campaign and enabled us to run dozens of successful ads that reached tens of thousands of people covering a variety of topics and tactics. Our goal is merely to help educate fellow Latter-day Saints about many aspects of LDS history that most members are not aware of. Many people have told us that they found the information presented on MormonThink to be invaluable. We wish to share the knowledge with all who are interested in learning more about Mormonism and its issues that the Church doesn't freely discuss. Please don't feel obligated to donate unless you truly have the means and only if we've helped you. NOTE: We are not a tax-deductible entity. Bill Johnson, founder of the MormonThink website.